Amit Shah & Rajnath Singh to address 6 big rallies in UP. 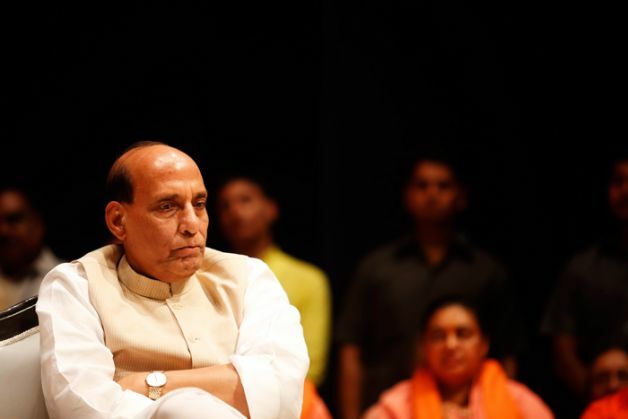 Will Rajnath be the BJP's face? Can he be the BJP\'s face in UP? At an organisational meeting of the state Bharatiya Janata Party in Lucknow on Saturday it was decided that 6 big rallies will be held in the state in the run up to the assembly elections in 2017. The meeting, addressed by the party's national vice-president and Uttar Pradesh in charge, Om Mathur, also decided that these 6 rallies will be addressed jointly by Amit Shah and Rajnath Singh. A move apparently aimed at keeping the Union home minister in good humour, especially after the party's bitter experience in Bihar in which many top leaders were miffed with Shah. With many BJP leaders from UP - Kalyan Singh, Murli Manohar Joshi, Lalji Tandon, Om Prakash Singh, Surya Pratap Shahi, Vinay Katiyar, - now pushed to the fringes, Rajnath Singh cannot be ignored. Will this appeasement be confined to addressing rallies or continue in the distribution of tickets too? Is there a chance that the BJP will project him as its chief ministerial face? Even if Rajnath Singh's past record as the state unit's president was a failure and as chief minister, disappointing, these will be tricky questions for the Narendra Modi-Amit Shah combine to tackle. With Amit Shah's backing Union tourism minister Mahesh Sharma has gained some political importance in the state, but the party is clearly not taking any chances with Rajnath. The party leadership is aware that the former UP BJP president still enjoys significant clout in the state unit and also among Thakur leaders like Raja Bhaiyya and Chulbul Singh. An indication of sudden love for Rajnath came when he jointly addressed a rally with Prime Minister Narendra Modi in Bareilly last month. Political watchers are keenly waiting for the central leadership to name the successor of state unit chief Laxmi Kant Bajpai, whose term has ended. There are two names doing the rounds - Manoj Sinha, MP from Ghazipur and Dharampal Singh, a three-time MLA from Aonla. Sinha is a Bhumihaar, while Singh is a Lodh. More importantly, the latter enjoys Rajnath's trust and his nomination would mean that the Union home minister will play a crucial role in the state in the coming months. Singh's appointment will take care of Rajnath's two main political irritants- Kalyan Singh who has always blackmailed the party because of his control over Lodh votes and Uma Bharti, who hails from the same community. Where does this leave the Brahmins who have traditionally enjoyed clout in the party and who will be his biggest challenger? Lucknow mayor Dinesh Sharma is considered too gentle a person to do that. With Kalraj Misra and Murli Manohar Joshi sidelined, the only one left is Mahesh Sharma, said a minor Brahmin leader of the party. Through Singh, Rajnath can also be expected to have a bigger say in ticket distribution. Laxmi Kant Bajpai, on the other hand, dismissed any rivalry with Rajnath parroting the party line of BJP being above caste and communal equations. "We do not take decisions based on caste lines," he said. Political scientist Prof SK Dwivedi rules out any caste rivalry because, "after Atal Bihari Vajpayee, BJP has not encouraged Brahmin leaders to come up." Dwivedi did mention Mahesh Sharma who, with the blessings of Modi and Shah, could emerge as a foil to Rajnath. "After all, Rajnath still does not enjoy the PM's trust," Dwivedi said. In 2014, BJP had fielded 17 Brahmins and 14 Thakurs, besides 25 OBCs, from UP. "If Rajnath Singh is allowed a role in ticket distribution, the number of Thakurs getting tickets for assembly elections may be substantially higher than Brahmins," said a local BJP leader. More in Catch - State BJP wants a CM nominee for #UP2017. Will Modi, Amit Shah oblige?